To launch for sale later tomorrow. 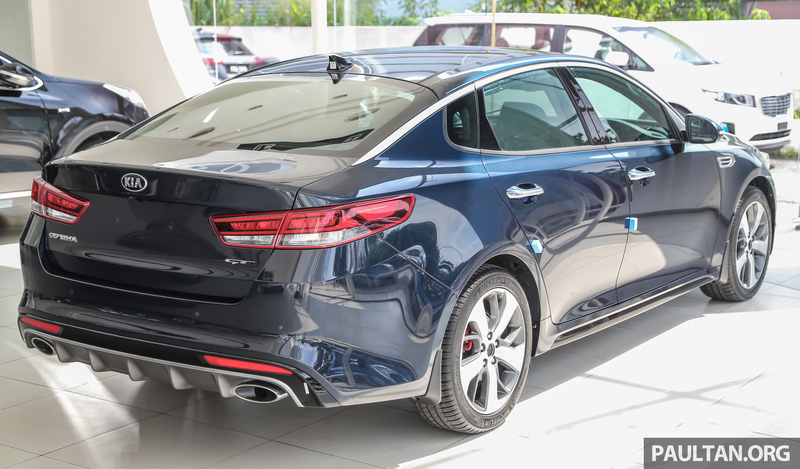 Paultan reports that bookings for the Kia Optima GT are open in Malaysia ahead of its launch tomorrow. It is estimated to be priced at RM 175,888 and rival the VW Passat 1.8 TSI and Honda Accord 2.4. Below are images of the car from the local dealer. 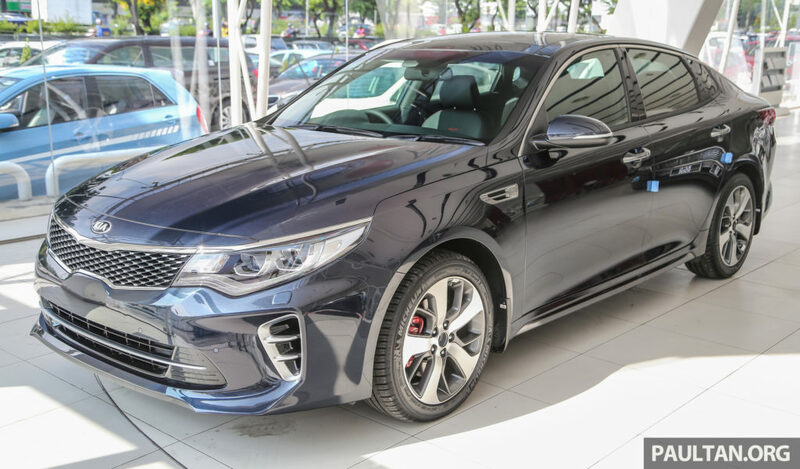 The sportiest variant of the Optima lineup measures 4,855 mm long, 1,860 mm wide and 1,465 mm tall and has a wheelbase of 2,805 mm. It has a sportive body kit with large air inlets, bold “tiger-nose” grille, faux side intakes, dual tailpipes flanking a diffuser and 18-inch alloy wheels shod with 235/45 Michelin Pilot Sport 3 tyres. The interior has a flat-bottom GT steering wheel with paddle shifters, drilled aluminium pedals, and black leather upholstery. Also available are an eight-inch touchscreen display, a dual-zone climate control system with Clean Air ioniser, ventilated front seats (cooling and heating functions), electrically-adjustable front seats (lumbar support and memory function for driver’s side). 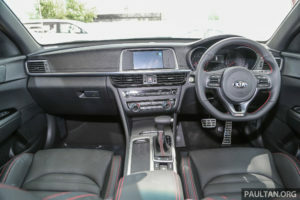 Some of the other notable features are rear air-con vents, rear power outlet, a sunroof, sun shades for the rear windows, navigation function in the infotainment system and a 4.3-inch TFT-LCD multi-info display in the instrument cluster. Six airbags, automatic brake hold, front and rear parking sensors, and a reverse camera form the safety kit. For a more dynamic driving experience, the suspension is tuned towards a firmer setting and has electronically-controlled dampers to adapt the ride quality. It also has larger disc brakes for better stopping power and Kia’s new rack-mounted motor-driven power steering (R-MDPS) for better feedback from the road. Under the hood is a 2.0-liter T-GDI petrol engine producing 242 hp and 353 Nm of torque, paired to a 6-speed automatic gearbox. It is capable of sprinting from 0-100 km/h in 7.4 seconds and hit a top speed of 240 km/h. The combined fuel efficiency is 12.19 km/l, and CO2 emission is 191 g/km (Euro cycle).